Paths & marking of Escapardenne are periodically inspected. 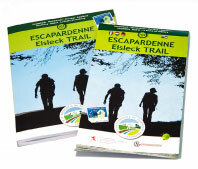 If, during your hike, you discover missing or damaged signs, please inform us by mail (info@escapardenne.eu) or via the “Feedback” tab. Due to forestry work the section Clervaux to Troisvierges is closed until 26.04.19! Please use the train line 10 to get to the accessible points by train. The section between Vernovlin and Cheslé is accessible again (Stage 5 Nadrin-La Roche-en-Ardenne)! Due to the damage caused by storm Eberhard the Section Troisvierges – Asselborn Moulin is currently not passable due to fallen trees. A deviation has been set up via the village of Asselborn (+200 meters up the hill).